Waffles have always been a breakfast favorite of mine. Give me a light, fluffy waffle over eggs any day. 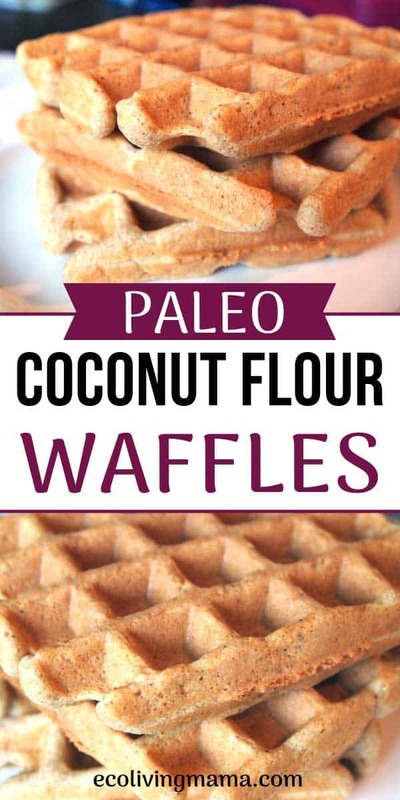 These coconut flour waffles are satisfying and packed full of healthy ingredients. They are also grain-free, sugar free, dairy-free and paleo friendly. I don’t always love the finished texture of coconut flour in baked goods, and I tried out LOTS of grain-free waffle recipes before deciding to adapt my own. 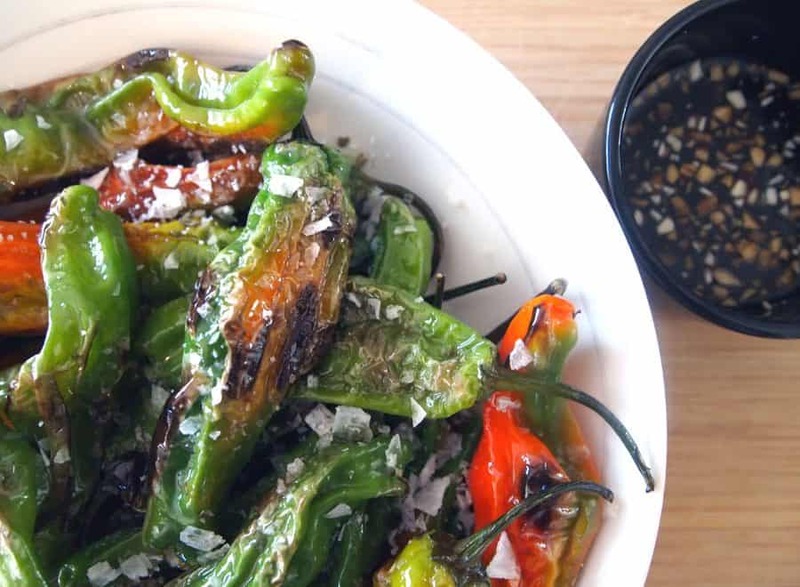 The addition of arrowroot powder in this recipe gives these a light texture that I really love. 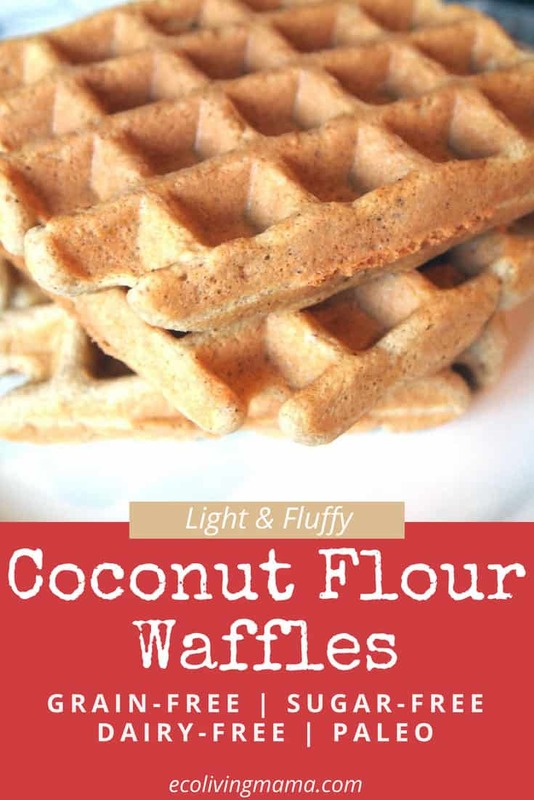 Oh, and did I mention that these coconut flour waffles are completely sugar free?!? I try to avoid adding extra sugar to recipes whenever possible, and I’ve found coconut flour to have a slightly sweet taste on its own. The additions of cinnamon and vanilla help these taste just slightly sweet without ANY sugar. A sugar free, grain-free waffle recipe that actually tastes good, woo-hoo! 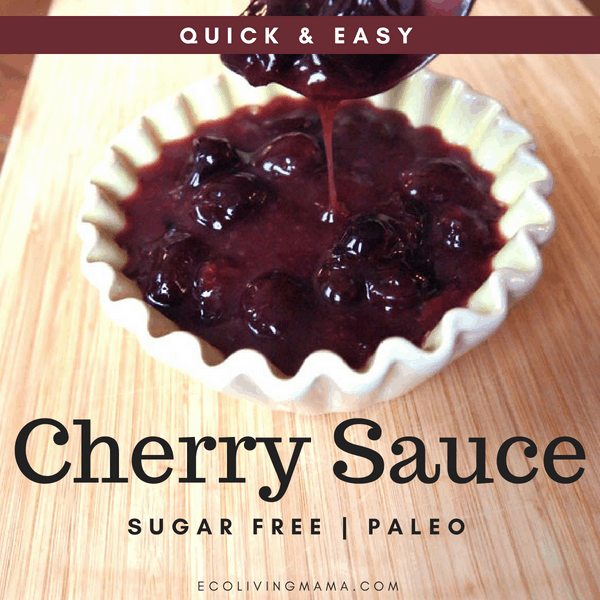 My absolute favorite ways to serve these for a weekend treat is with a super quick and absolutely delicious, sugar free cherry sauce. It uses frozen cherries and has NO SUGAR. My kids devour it and ask for it whenever I make these coconut flour waffles. If you are feeling crazy and ok with a little sugar for breakfast, try adding chocolate chips to the top of your waffles and then topping with the cherry sauce. OMG, it tastes like dessert! I’ve been adding arrowroot powder to lots of paleo and grain-free recipes lately, and I have to say I am really loving the results. I especially love it with almond flour; it helps to give the overall finished product a much lighter and cohesive texture. Arrowroot has lots of uses, and is typically used as a thickening agent. If you haven’t tried arrowroot powder in any of your recipes yet, you need to! You should be able to find arrowroot powder at your local natural grocery store. I typically shop at Sprouts and they carry it in their baking isle, as well as a small spice size jar with the spices. For this recipe you need a whole cup, so you’ll want to get the larger size from the baking isle. It can also be purchased online – I like this brand. Any natural grocery store will sell coconut flour, and probably lots of regular stores as well. My Costco sells it in a huge Costco sized bag, so that is where I typically purchase it. I like this brand. 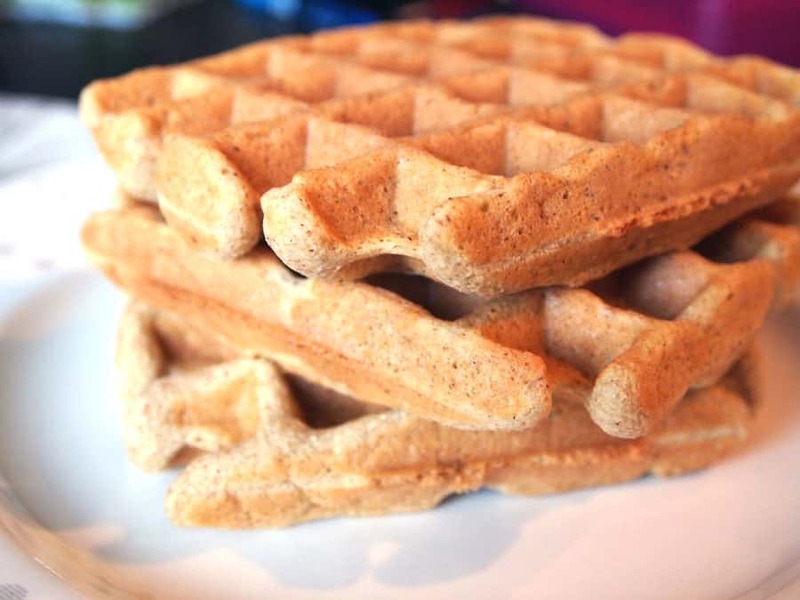 Ok, back to these delicious grain-free waffles! These come together really quickly in the food processor or blender. No need for multiple bowls here! And this makes a BIG batch. I cook for a family of 5, and like to have these leftover, so I always make a bunch. These coconut flour waffles freeze beautifully, so if this is more than you can handle for one meal, toss them in a freezer bag and they’ll keep for a couple of months. 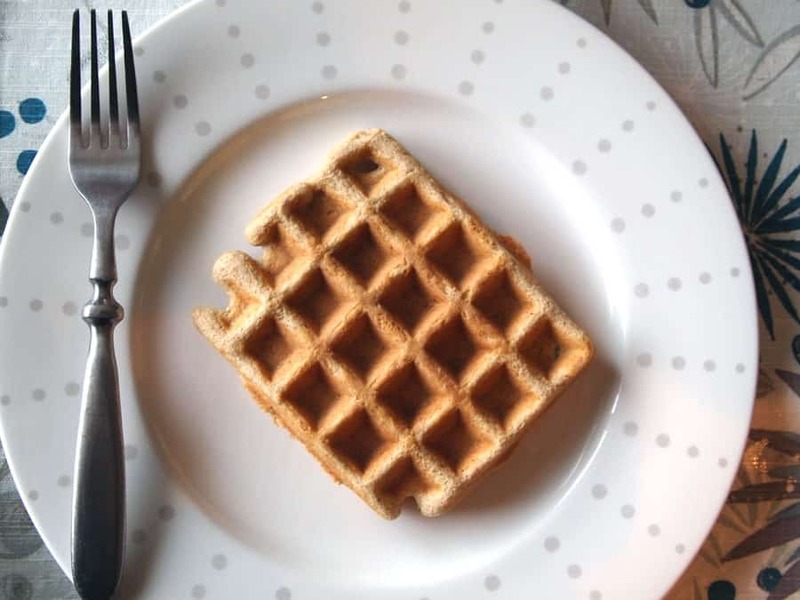 Just pop one of these grain-free waffles in the toaster to re-heat and breakfast is served. These coconut flour waffles are satisfying and packed full of healthy ingredients. They are also grain-free, sugar free, dairy-free and paleo friendly. 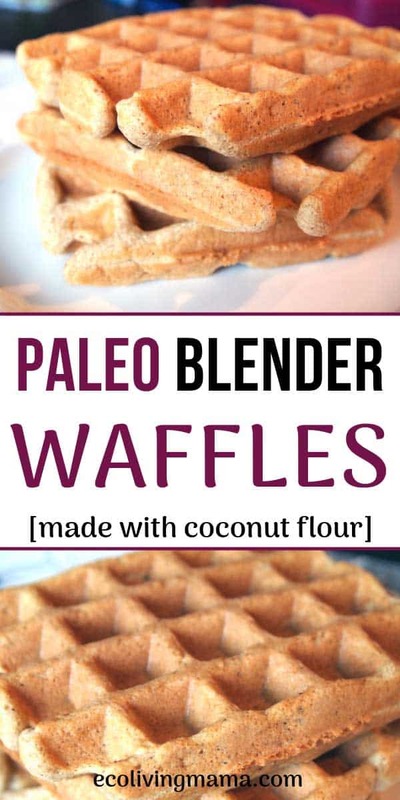 These paleo waffles freeze beautifully! This makes a BIG batch, but I always prefer to make large batches this size because these are SO good leftover. Just pop them in the toaster, top with whatever you like (try nut butter, yum!) and breakfast is served. These coconut flour waffles are perfect topped with my sugar-free cherry sauce recipe. Or they make a wonderful after school snack for kiddos! Top it with your favorite nut or seed butter for an extra dose of protein. 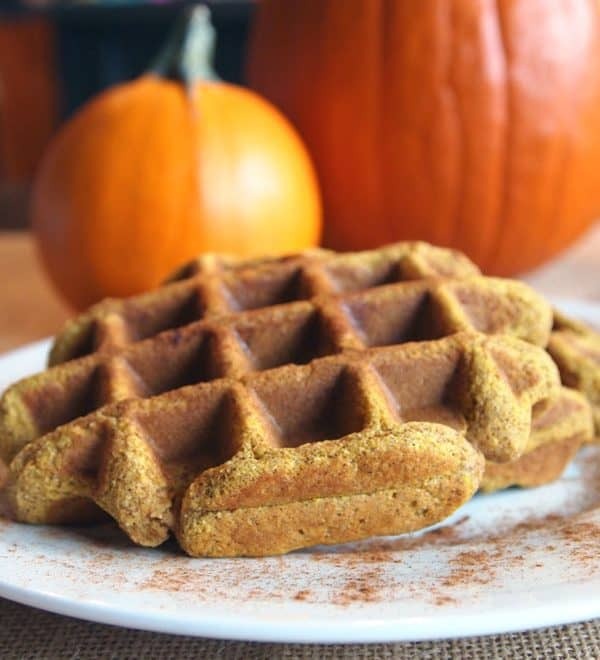 Also check out my Coconut Flour Pumpkin Waffles for a delicious fall inspired take on this breakfast treat. Is the coconut oil or butter supposed to be melted or solid? Also my batter never got thick. Odd that your batter didn’t thicken…mine is always very thick and gets even thicker as it sits! Did the waffles turn out? I’m guessing the butter or coconut oil should be melted before adding? Trying these this week~ thanks for the recipe! Let me know how they turn out, hope you love these! Why is there a section in the blog that talks about arrowroot powder when it’s not in the recipe? Hi Shannon, there is arrowroot in the recipe, 1 cup. I see it listed in the recipe ingredient list, does it not show up for you?